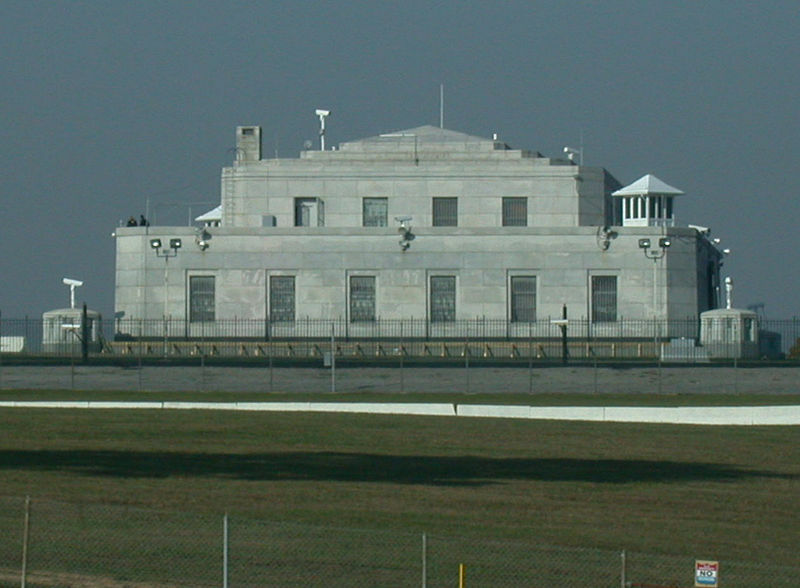 Is there Gold in Fort Knox? Is there gold in Fort Knox? That question is completely irrelevant. Why? Will it really make a difference? The stories of no gold in the vault are just spun by people so desperate to support a gold bull market it is just crazy. I was given a tour of the NY Fed years ago and there was gold there. The US started going after the Swiss and threatening to seize their assets here in the USA for hiding Americans with assets. Without fanfare, the Swiss quietly took ALL their gold and moved it out of the USA. The stories spun around Germany were nonsense as well. Try looking at this dispassionately. This is not the stuff that is going to make gold rise. We do not need this type of tin-foil hat nonsense to create a bull market and it really does FAR MORE damage than the Goldbugs suspect. People who are not buying gold refrain from doing so because of stories like that. They do not take all these claims seriously and perceive the idea of buying gold as the lunatic fringe when based on stories that cannot be proved. Gold will rise because it is the HEDGE against government. It is ONE investment that enables one to move their wealth from one medium of exchange (currency) to another when the new one comes down because of fiscal mismanagement. They also tout hyperinflation but both Germany and Zimbabwe could not sell debt so they printed. Advanced societies sell debt today. It is worse because it is printing money that pays interest. Real estate and shares in companies will provide that same mechanism as gold did in the case in Germany. In fact, the new currency to replace the hyperinflation was backed by real estate. But for shares and real estate to survive requires the society to survive or in other words blink BEFORE the Mad Max conclusion. The rally for the metals during 1970-1980 was interesting. All the stories spun today were invented in 1971. It was Chicken Little and sky was falling. If gold was formally the reserve monetary unit, the French and the Swiss were redeeming dollars for gold to build up their reserves. The French in particular saw this as their destiny that was stolen from them at Waterloo. They gold standard failed because, as always, you cannot fix anything in constant value for there is a business cycle. Those that preach money must be tangible and fixed, should look at Europe and the protests with massive unemployment created by austerity curtailing the money supply at least in appearance. It’s YOUR responsibility to invest wisely. Why do you expect tangible money so government does it for you? You really trust their management skills? You cannot demand government never increases the money supply so you do not have to worry and hold your cash while simultaneously expecting real estate, wages, and share prices always to rally. 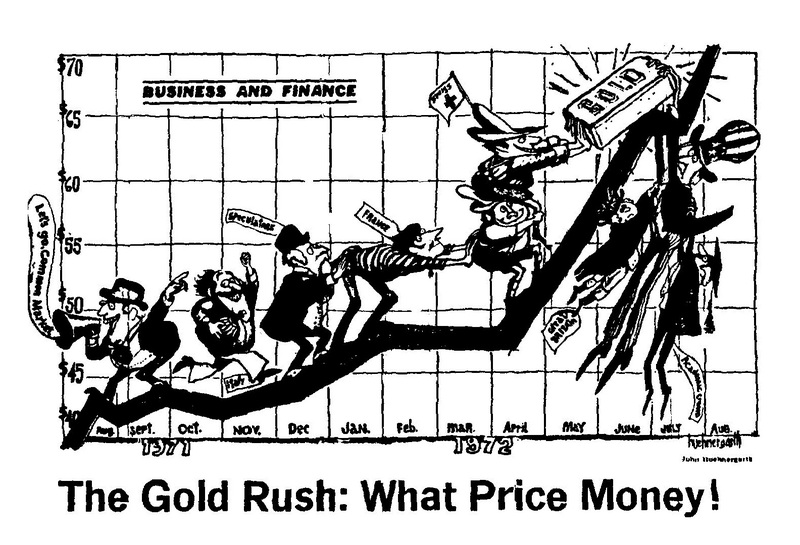 The gold rally between 1971 and 1980 was about a readjustment. The price of gold was fixed at $35 for 37 years since 1934 and 1971 it could not be maintained any longer. Gold had to rise in proportion to everything else like oil because it had been artificially suppressed by the Gold Standard. It made its first leap into December 1974 reaching $197.50 on the expectations that it would be legal in 1975 for Americans to buy gold since 1934. The Europeans pushed gold up and the talk was it would reach $500 once when Americans would start to buy. I was in the gold business. I did not see even three people in line to buy gold. 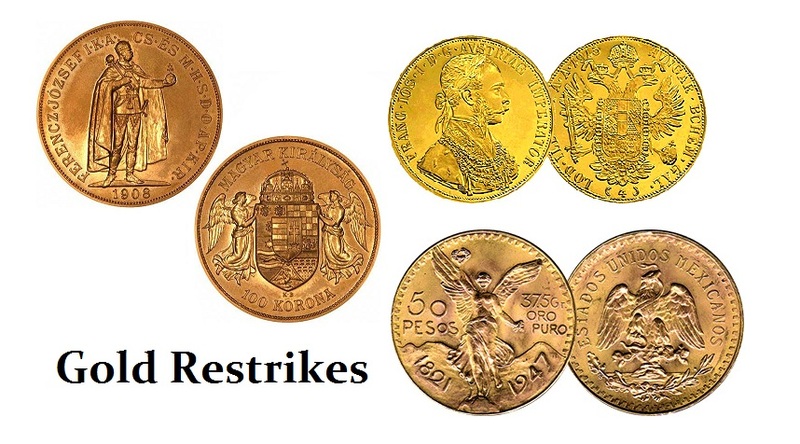 Those who bought gold had always been able to do so using coins that were restrikes to get around the US law as long as they were dated 1947 or before. So Americans could buy gold and were doing so in the 1960s. That was a huge part of the “coin business” in those days. I personally sold that high right there in December 1974 ONLY because I did not believe the Europeans were right given I saw no change in demand in the US market. Gold collapsed falling to $103 by August 1976. That is when I began to notice the fundamentals did not change . They were the same going up as they were going down. These same fundamentals are still used today to sell gold in TV ads from fiat to there is not enough gold in the vaults. But gold dropped 50% and nothing changed. I began to realize buying gold on those fundamentals was dumb luck for that was just not the real driving force. It had to be more concrete than that. I had been watching the Economic Confidence Model with curiosity. It bottomed 1977.05 and was turning up showing another wild boom. I decided this thing was always right so I put my money where my mouth was. I even signed a lease for 10 years getting them to get rid of the clause indexing it to CPI since everyone was talking about a Great Depression. The rent I fixed at $10 a square foot and it soared to $35 by 1980. They had me in court 3 times trying to get out of that lease on technicalities. I knew about the Hunt Brothers. They were buying silver when it was a $1.29. They were convinced it would rise with the collapse of the Gold Standard. I went to my banker in 1972, told him about the Hunts and applied for a loan to borrow several million stating it was investment and offered the bank could store it. I was turned down and my banker told me I should have just said it was for inventory. They were not allowed to lend for “speculation” in those days. When silver hit $50 in 1980 and Hunts became a household name, the banker was telling everyone what I tried to do and had he just done the same he would have retired a multimillionaire. So the fundamental spin always sounds nice. People hate me for pointing out their nonsense. But if you want to make the metals PRIME time, you have to stop the tin-foil hat nonsense and treat it like ALL serious investment. Who cares if Fort Knox has gold or not. It is IRRELEVANT!!!!!! They will never admit there is no gold – so what! Gold will rise exponentially ONLY when it is time and it will be because the entire financial system is cracking not whether there is gold in Fort Knox or not. Gold has to get through the $2300 level first before it starts to really get interesting. So what if it goes to $1150. Big deal!!! This is a market like anything else. ANYONE who ONLY says BUY BUY BUY is not worth listening to because they have NO respect for your financial well-being. This is about surviving!!! Not promoting something all the way down loading you up worth losses until you break. You buy the LOW not the HIGH. Are they independent or is someone paying them to say that nonsense. When I was first expanding to Europe, I went to lunch with the head of one of the big Swiss banks. I gave him a list of European sounding names for the company because there was much anti-Americanism in Europe. He asked me to name ONE European analyst. I could not and was very embarrassed. He laughed and said that is why everyone was using to Princeton Economics. He said every European was always bullish their own currency even when it went down just like the gold promoters today. He explained, we were the biggest because we DID NOT CARE if the dollar went up or down. We called the shots as they developed. The object was to survive – not tell people what they wanted to hear or what government wanted us to say or some other person profiting from bogus advise as the Investment Banks did going into the 2000 Dot.COM Bubble. Until the same thing happens in Gold instead of churning and burning investors with BUY only recommendations assuming they are idiots with no sense of respect for their survival, then sadly there will be a lot of people who sell and do not come back because of their losses like the Japanese for 23 years. This about survival. Stock brokers also never said SELL during the Great Depression. What is the point of such promotion that is always one-sided? Just ask WHY?